The property is recently refurbished to a high standard, the rooms are airy and comfortable spreading out over two floors and look out over Tenby High Street, great for sitting and people watching in the tall bay windows. The apartment is literally above the High Street so brilliantly located for short walks to Tenby's lovely restaurants and pubs or shopping, there is less than a minute in the opposite direction to reach the clean and endless beaches and the pretty harbour just below. There are two double bedrooms, a twin with an en-suite bathroom and a double bedroom with a single 'day' bed that can sleep a third adult or child, there is plenty of room for a travel cot as well. An additional two guests can sleep on the large sofa bed in the main lounge, there is also a bathroom on this floor. The property now benefits from free Wi-Fi and dogs are allowed on request. We manage the property here and try to fit as much time in ourselves around bookings, our families have always loved Tenby so much, it is our second home. The flat is so perfectly placed, it is brilliant for people watching in the evenings with a glass of wine sat in the windows overlooking the High Street and just a few yards out of the door to the top of the Harbour and the North Beach. While an apartment it is set over two floors so ideal for families as the children still have quiet upstairs. It is right in the heart of all happening in the town or on the beaches and harbour. En-suite bathroom with bedroom two has a enclosed shower, the main bathroom is on the first floor with a shower over deep bath. The living room has a sofabed which can sleep another two people and lounger chairs, it also has a seated area in the window bay. There is television with freeview and DVD player and a I pod dock and radio. There are games, DVD's CD's and books. The kitchen is open plan to the dining area and lounge, it has a cooker, hob, microwave and fridge freezer, all of the crockery and glassware have recently been replaced. There is also a washing machine for cleaning up after a sandy day at the beach. Notes on accommodation: We hope you will enjoy the beach house feel of our property, it has been decorated specifically to be airy and neutral to reflect the beauty of the town and beaches that surround it. We have included many games, DVD's and books as well as modern entertainment systems for the odd rainy day in, the kitchen and dining area is well equipped for sitting around over a take away from the excellent selection of shops in the town and we have posted menus on the welcome board if you don't want to venture out on your arrival, we would recommend many eating establishments locally, especially the Plantagenet, the Bay Tree and the Mews diner, the Bucanner has some of the best pub food in town and morning coffee in the Quay room is a cosy must. The apartment is a few steps away from the harbour and both of Tenbys fabulous beaches, there are boat rides to Caldey Island from the harbour and the harbour itself is a lovely stroll in the evening with the boats chiming in the harbour. Cleaning / Towels / Linen / Maid service: There is fresh linen provided on the beds and tea and kitchen towels, guests are asked to provide their own bath and beach towels. Other: There is a dining area that seats six comfortably between the lounge and kitchen space. Fantastic accommodation. Brilliant location. Nice touches ..... tea and coffee, shampoo, etc. Absolutely loved it. Lovely apartment, nice & clean. Very well equipped & plenty of room. Good central location. Good communication from the owner. Will return again. 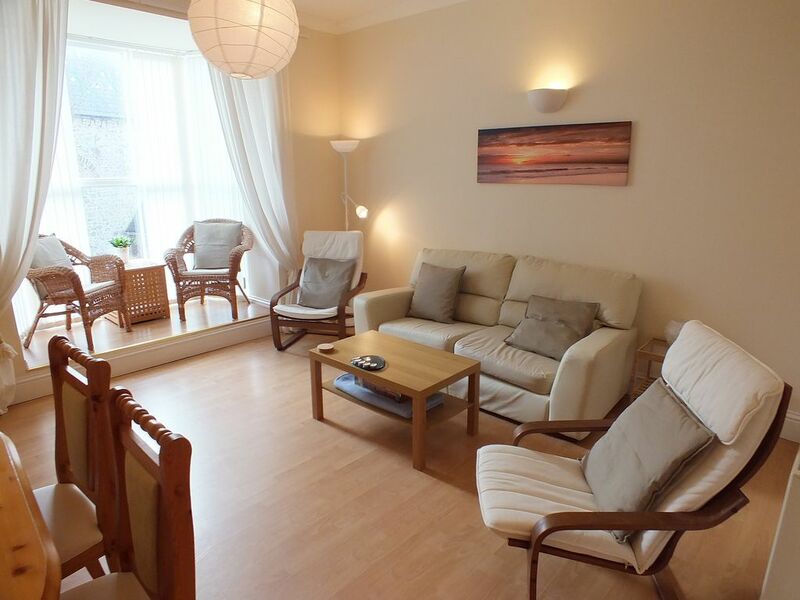 This apartment is in a fabulous location, in the heart of Tenby. It had all we needed for our family of 5 to cook our own meals and spread out after a long day of sightseeing in the area. The beds were comfortable and the unit was clean and welcoming. We hope to return in the future! Located in the town centre, close to everything you need. Very nice and clean apartment. Good communication with the owner which has let us to check in early without any problems and extra charges. Nice place, clean and organised. Matched everything in the description of the property. There are many other attractions a few miles from Tenby itself, there is a golf course near by, Heatherton activity park is a few miles away, as is Saundersfoot town. It is a short trip to attractions like Oakwood and the whole Pembroke coast. PLEASE BE AWARE OUR PROPERTY AND THE AREAS THAT SERVICE IT ARE TOTALLY NON-SMOKING AT ALL TIMES. Booking Notes: A deposit of 25% is required to secure your booking with price paid in full six weeks before your holiday. Changeover Day: Changeover day is a Saturday, please contact us if you would like to request a different day and we will see what we can do. Notes on prices: Weekend or mid week breaks are available on request, please get in touch for prices and availability.